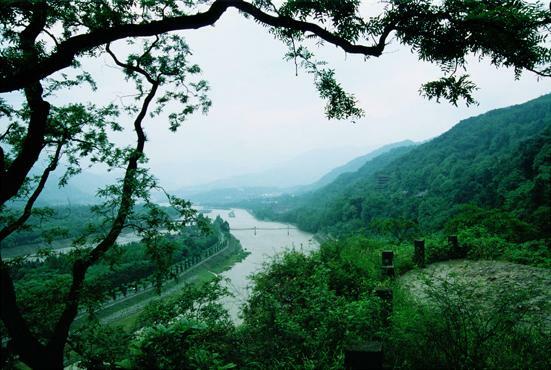 That's not the Tennessee Valley- that's the Funan River near Chengdu, the sister we don't seem to talk about much. My creativeness had run dry this week, so I started re-researching Knoxville to see if I could find anything interesting to bring to the attention of the Wigshop's esteemed readers. Wikipedia, that questionable fount of knowledge, always helps me addictively learn more about unfamiliar parts of the world, but sometimes it's even more interesting to look up the familiar, such as the city we live in. One can learn strange, exotic things about our (couch?) city, including the fact that we have a sister city in China with a river landscape surprisingly similar to our own. Chengdu has a major university, much like Knoxville, though it isn't on a hill. They also have a signature bridge, called Anshun, or "Peaceful and Fluent" with a popular restaurant (dining on the river? that sounds familar). I wonder if the Henley Street bridge has any eloquent nicknames... maybe "Home of the Blind Ragpicker?" Chengdu seems like a nice place: scruffy, hardworking, with occasional beauty. Just like us. Maybe they're called "the couch" of China. They totally have their own sunsphere look at this picture it's amazing. a sunsphere with FOUR legs?! it's blowing my mind away.